O’Sensei Philip Porter passed away at 2:30pm Sunday, August 7, 2011. He was diagnosed with terminal cancer of the liver and pancreas. He slipped into a coma Thursday morning and did not regain consciousness. While I understand not everyone agreed with Phil, we all must recognize his contribution to Judo and the other martial arts. Please join with me in wishing his family well. In 1943 Philip Porter began his Martial Arts career in boxing. He was 18 years old. He later became a member of the West Point Boxing Team;an in 1950, he was the Light Heavyweight Boxing Champion of the Western Area of the Air Training Command, USAF. Porter graduated from the United States Military Academy at West Point in 1948, and served in the U.S. Air Force for 20 years. He retired as a major in 1967. It was his leadership ability that brought him high positions in the martial arts. In 1951 O-Sensei began training in Judo, JuJitsu, and Karate at Travis Air Force Base, California. Hi instructor was Sensei Walter Todd, a 9th Degree Black Belt, passed away in 1999. Porter was 27 years and soon started coaching as well as competing. In charge of teaching and watching over the rank promotions of thousands of his Black Belt students throughout the country in nearly 1,000 clubs of the United States Martial Arts Association, he is called O-Sensei. Budo Taijutsu: Judan (10th Degree), 1998 by Dr. Masaaki Hatsumi, 34th Soke of the Togakure Ryu. Judo: Shodan, 1954; Nidan, 1956, Budokwai, England; Yondan, 1963-Personally presented by Sumiyuki Kotani, 9th Dan, of the Kodokan, after O-Sensei placed third in the U.S. Judo Nationals at age 38. (Kotani Sensei was later the only living 10th Degree in Judo in the world). Rokudan, 1973; Shichidan, 1981; Hachidan, 1989; Kudan, 1994, Judan, January 1, 2004. Note: There are now about 25 living Kudan (9th Degrees) in Judo in Japan, and a few more outside Japan. There are now three 10th Degrees in the world, Anton Geesink, Philip S. Porter, Keiko Fukuda, and no living Japanese 10th Degrees. There have been 16 Judoists of 10th in the history of Judo, 12 who were Japanese. The last Japanese Judan was Sumiyuki Kotani Sensei, who died on October 19, 1991, at age 89. He was O-Sensei Porter’s revered teacher. JuJitsu: All degrees, 1st through 9th (1951-1994) by USJA. Judan (10th Degree) 1997 by USMA and Beikoku Mizu Ryu JuJutsu. JunKinShin. Soke-10th Degree. Jun Kin Shin is the JuJitsu ryu founded by O-Sensei from his many years experience in teaching self defense to law enforcement and military personnel. He awarded only a few ranks in this system because he did not consider the system complete. Karate: 8th Degree (Honorary) 1996 by the American Shotokan Karate Alliance. Moo Hap Sul Hapkido: 9th Degree (Honorary), 1997 by House of Discipline Martial Arts Group. Taiho Jitsu: Judan (10th Degree) 1997 by Mid-Atlantic Self Defense Association. Wushu: 9th Degree (Honorary) 1994. In 1951 O-Sensei Porter begin competing in Judo, and was still active in masters competition for most of his life, a competitive career spanning 50 years. He was US Air Force USAFE champion in 1957, placed in the US Senior Nationals in 1963, won the US National Masters Championship four times (1975,1977, 1980 and 1981), and won two gold and a silver medal in the 1998 World Master Athlete Games in Ottawa, Canada. O-Sensei Porter is called “The Father of American Judo”. He helped found the USJA in 1954, and over a period of 41 years, he personally built it into the largest Judo group in America, as well as the largest non-profit martial arts organization in the country. Below are listed a few of O-Sensei Porter’s leadership achievements in American martial arts. Porter served three years as National Chairman of the AAU Judo Committee (1961-1964), Chairman of the U.S. Olympic Judo Committee (1964-1968), Secretary General of the Pan American Judo Union (1964-1967), Technical Director of the Pan American Judo Union (1967-1969), President, U. S. Judo Association (1980-1995); Editor, “American Judo” (1960-1995), President and Head Coach, National Judo Institute and National Judo Team, (1980-1995), and President of the United States Martial Arts Association since 1995. O-Sensei trained in England at the famous Budokwai in London for a period of four years (1954 to 1958) while in the Air Force. 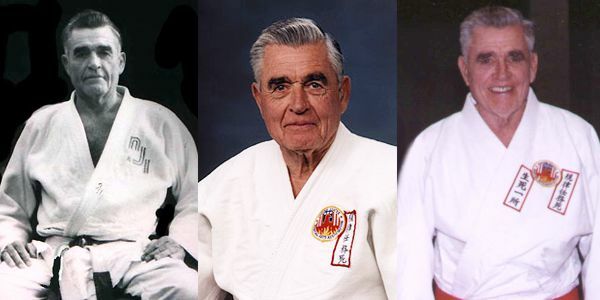 At that time his teacher was Trevor P. Leggett, who is now the only 9th Degree in Judo in Europe, and with O-Sensei Porter, one of only a few 9th Degrees in Judo outside of Japan. Porter founded and became President of the U.S. Martial Arts Association in late 1995. The USMA is the only non-profit American organization devoted to unifying the martial arts in our America, and recognizing all martial arts. For many years, Philip Porter was active as a national and international referee in Judo. In 1967, he rewrote the IJF contest rules. He refereed the finals in the 1965 World Judo Championships in Brazil between Geesink and Matsunaga. In 1964, he served on the six member Consultative Committee of Referees for the first Judo Olympics in Tokyo. He was the referee for the team finals in the World CISM Games of 1971 in Vienna, Austria. O-Sensei was working on a special book which will contain the contest rules for Judo, JuJitsu, Tae Kwon Do and Karate, and will include explanatory commentary. O-Sensei Porter’s coaching accomplishments are legendary. He has produced over 1,000 national and international medalists in Judo over the past 45 years, 500 of them during the eight years he coached the National Judo Team at the NJI (1984-1992). No other coach in America has even approached this record. His team won six medals with six athletes in the 1991 Pan American Games, including Kate Donahoo’s Gold Medal. Kate Donahoo also won 5th place in the World Judo Games of 1989 and 5th place in the 1992 Olympics. In 1962 Porter hosted the first National Collegiate Judo Championships at the US Air Force Academy, wrote the constitution and bylaws of the first National Collegiate Judo Association, and served as both its Secretary, and later as its President. Hall Of Fame Honors. World Martial Arts Hall of Fame. O-Sensei has also been honored (April 1997) as a member of the World Martial Arts Hall of Fame as the recipient of the coveted “Heritage Award of Excellence” award. International Karate & Kickboxing Hall of Fame. O-Sensei was inducted into the International Karate Hall of Fame at a special ceremony conducted in Cleveland, Ohio in April, 1997. World Headfounders Council. O-Sensei was admitted as the 18th member of the World Headfounders Council in July, 1997. He is the 18th member inducted out of 3,219 applicants. In May, 1998, O-Sensei was inducted into the Martial Arts Masters, Pioneers and Legends Hall of Fame Council International in the highest category, “Legend…. In 2000, O-Sensei created the USMA International Hall of Fame and the USMA National Junior and Senior Training Camps. The fifth consecutive yearly event, is scheduled to be held in St. Louis, Missouri in July, 2004. O-Sensei Porter has been granted several honorary Doctor’s degrees, and has written many books on Judo, JuJitsu, and other Martial Arts. He is now working on the American Martial Arts Character Achievement Program (AMCAP) and several other books. O-Sensei travels extensively, over half of the year, conducting Martial Arts seminars as Founder of the USMA. His primary emphasis is on two important areas: (1) Character development for young people, and (2) Fostering American excellence and international victories in JuJitsu, Judo, and Karate through the eventual establishment of a USMA international training institute for all Martial Artists.